Planning to develop a hot new chilli sauce, delicious curry paste or perfect Pomodoro for the restaurant, café or retail market? Looking to add exciting new flavours to your menu? Look no further. Quattro Foods is one of the UK’s leading sauce manufacturers, creating top quality, wholesale and retail food industry sauces. What makes our sauces special? Our innovative food solutions have secured our reputation as one of the UK’s top sauce producers. We supply foodservice suppliers who in turn serve cafés , restaurants, pubs and retailers, taking Quattro’s acclaimed products to the high street. Our many satisfied customers will tell you that two of the things we do best are high quality sauces and high quality service. Made with premium ingredients, by chefs for chefs, our sauces are delicious and convenient. Our diverse and flavoursome range includes tangy pesto, spicy curry sauces and a delectable Italian range. We also produce sweet and sour sauces, rice and pasta sauces, marinades and BBQ sauces. 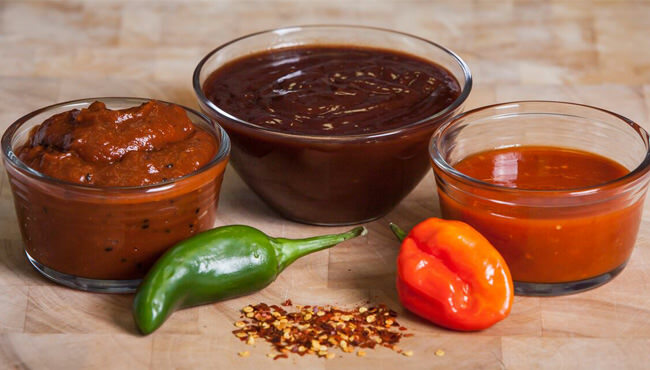 Exotic sauces include Piri Piri and the zingy Louisiana Hot, Spicy Shakshuka and Black Bean condiments. We have created a vast range of colourful, vibrant and flavoursome sauces for our customers. Tell us what your customers like to eat and we’ll put together a mouth-watering range to suit your needs. Our team of experienced chefs aims to cater for diverse customers by producing two distinct types of sauces; our bespoke sauces are developed for specific and direct customers, and our development of chefs’ ingredients ambient sauces which are sold in bulk and aimed predominantly at foodservice provision. The range is extensive, offering a choice of flavours and textures, and retaining the consistently exceptional taste upon which Quattro Foods has built its unrivalled reputation for menu solutions across the UK and Europe. The perfect accompaniment for a classic beef burger, is firm favourite chilli jam – just one example of the exciting flavours we offer as a sauce supplier. We can supply you with high-quality sauce to sell or serve. Amongst others, our unique BBQ sauces and relishes are loved by our customers. As a sauce supplier, Quattro Food’s exceptionally tasty and convenient ready to use sauces are conceived to save time in large and busy kitchens. Our ready to use sauces offer good value alternatives to fresh sauces. Quattro Foods’ experienced and skilled team of chefs uses traditional preparation methods in nut-free, state of the art kitchens. With a reputation as the sauce company the UK relies on, Quattro Foods’ sauces are designed for convenience, whilst maintaining outstanding results. Offering bulk quantities for the wholesale sector and smaller orders on request, the Quattro Foods team strives to assist businesses with limited time and resources with convenient menu solutions. Quattro Foods is a leading UK sauce manufacturer and sauce supplier, producing the highest quality sauces for the food service industry and ultimately satisfying the discerning high street customer, looking for intense flavour from the freshest ingredients.